What motivates people to participate in public hearings? That’s a central question when working with citizen involvement. Getting participants is challenging due to various reasons like a lack of trust in the system, preoccupation, lack of motivation etc. And the golden rule: the more the merrier! We need as many participants as possible. How many surveys have we made only to have no results? This was our challenge in the Vesterbro Ungdomsgård project. Vesterbro Ungdomsgård is a youth club, located in the heart of Vesterbro, one of the hippest areas of Copenhagen. However, Vesterbro has not always been like this. When Vesterbro Ungdomsgård was first established in 1958, Vesterbro was known to be a working class area, with bodegas around every corner and prostitutes dominating the sidewalks. In such a context, Vesterbro Ungdomsgård created a space for the youth where they could flourish, away from their otherwise not very inspiring daily lives. That is how Copenhageners started to recognize the institution as one of the most progressive of its kind, especially in musical and theatrical scenes. This reputation highly shaped our design process when we were asked to redesign Vesterbro Ungdomsgård’s front yard and inspired us to leverage the voice of youth more than ever to be in accordance with Vesterbro Ungdomsgård’s long history of democracy and innovation. We started our collaboration with Vesterbro Ungdomsgård in 2014 when we conducted a series of architecture workshops with the members to identify their needs and wishes for the front yard while teaching them how to design and visualize their ideas. Based on these workshops, a series of scenarios for the front yard was developed. These scenarios were put to the test, using around 20 movable boxes that could be arranged into different compositions in order to produce various spaces. 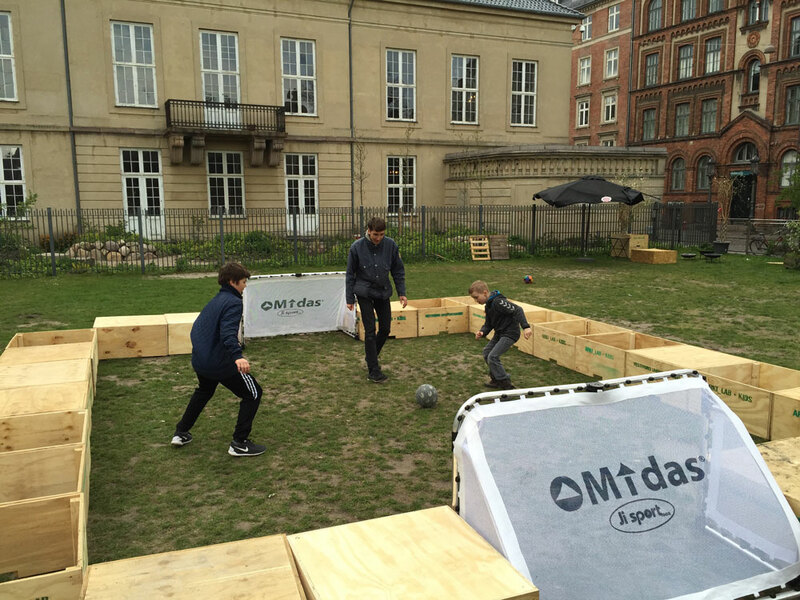 These boxes were used to make sitting areas, delineate a football pitch, make pop-up playgrounds and more. 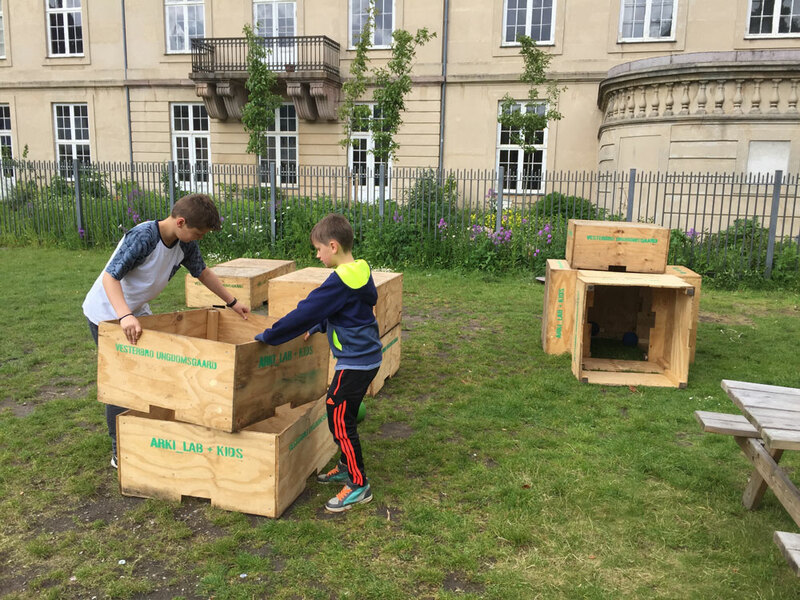 After testing out ideas and building up trust with the youth, it was time for Vesterbro Ungdomsgård to move forward with the project and to use the knowledge drawn from the pilot project to make more permanent changes. To make this happen, we ran a second round of workshops where we went to Vesterbro Ungdomsgård with a map of the area, big markers, speech bubbles and a series of inspirational images. This time the plan was to draw the young people’s ideas and dreams, based on the outcome of the pilot project. After 10 days of workshops, we went home with almost a hundred drawings. The most challenging part started there. We closely looked at each drawing, extracted the main design features and distilled the essence of each idea. The next step was to categorize the main design features. After categorizing all the ideas, we went to Vesterbro Ungdomsgård with a small pamphlet that contained all the design ideas, so the staff and the youth could vote on the ones that they favour the most. They were able to vote on function, shape, material, colour, etc. We did not exclude any ideas from our small pamphlet; the idea was for them to choose the best. That was an interesting and educational process for all of us. In many cases the youth voted on an idea that wasn’t theirs because they could see that it worked better. To be even more democratic, we also made a digital version of the pamphlet and posted it on various social media platforms so everyone who was interested in the future of the project could be included. After the pamphlets were completed and the survey closed it was finally time to count the votes, compile the data and design. It was a long process, but the outcome could not be more rewarding. Detailed ideas have been written into a program which is currently put out to tender. We are sure that Vesterbro Ungdomsgård’s makeover will happen soon! It is going to be an urban space that everyone can relate to and take ownership of because they can find themselves in it. The final outcome of the survey showed how the participants involved in the project voted for getting a fireplace, outdoor kitchen and benches. 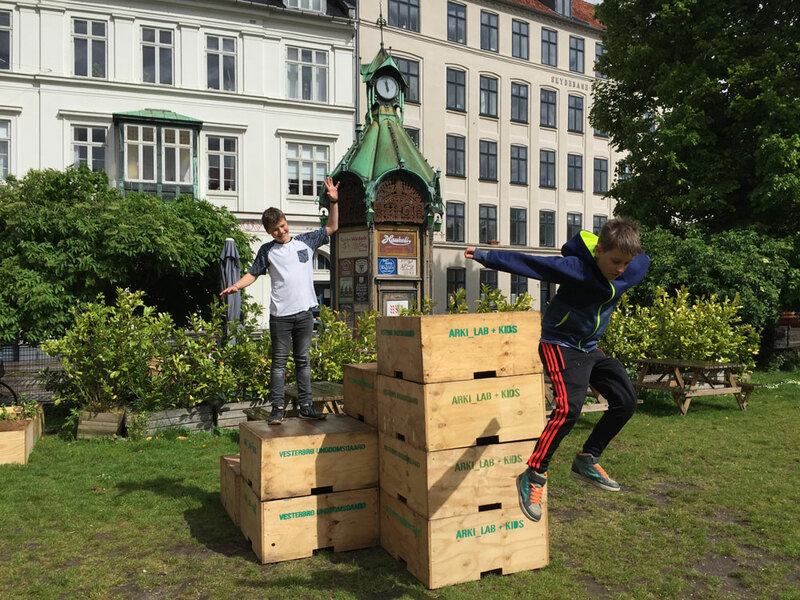 These elements was built in collaboration with the young people from Vestebro Ungdomsgård and all made out of recycled wood. The material used for creating all of these elements are made out of recycled wood.